You are here: Home / I'm Bringing Bolshack Back! Hello there all of my fellow Kaijudo duelists, do I have a surprise for you! I recently participated in an online quiz that was run by Wizards of the Coast that granted an exclusive preview card to the first correct answer. Not only did I get one of these cards, but it just so happens to be one of the Super Rares in the set and I'm writing this article just so I can share it with all of you out there! Without further ado, let me introduce you to "Supreme Dragon Bolshack!" There's a lot to take in with this card at first glance, so let's break it down and talk a little more about what makes this card "Supreme." It's a Fast Attacker with Triple Breaker: This is the first of its kind. Up until now we've had Double Breakers that can appear out of nowhere, but now we finally get a creature that doesn't always need a [ccProd]Jump Jets[/ccProd] to be aggressive. It has 12000 power, so there won't be a lot of creatures that will be able to take this guy on outside of the Monarchs (at least that we currently know about). It is a level 9 creature with a rather specific effect, so this isn't something that most people will just splash in their decks. This requires the user to have somewhat of a focus around Armored Dragons. The "Rally the Dragonflight" effect is an amazing replacement effect that can be very effective in a couple of regards. For one, this is the first Fire Civilization card to allow you to search through your deck for a card. This means that you now can gain knowledge of what could be in your shield zone through the process of elimination. Also the fact that this card will not "whiff" when it is targeted in an Armored Dragon centered deck. Cards like [ccProd]Almighty Colossus [/ccProd] only let you choose from the top three cards of your deck, while Bolshack allows you to go through the whole thing! There's a lot of cards we have yet to see from Quest for the Gauntlet (nearly 160 at this time), but I would wager that we'll be seeing more level 7 and less Armored Dragons within the set since the set is now designed with drafting in mind. That means that this card will be playable within the set itself without any outside influence... so yes, there will be dragons! As of right now though, when the set releases and the Standard Format kicks in, there will only be ten cards that can be used with Bolshack's effect. Most notably are [ccProd]General Skycrusher [/ccProd]and [ccProd]Overlord Sargon[/ccProd]. Imagine attacking your opponent with this and they hit it with a [ccProd]Terror Pit[/ccProd]. You then nonchalantly search through your deck for a copy of [ccProd]Overlord Sargon[/ccProd] to continue the onslaught of Fast Attacking Armored Dragons! Not quite your style? You can always go ahead and search for [ccProd]General Skycrusher[/ccProd] to banish those pesky smaller creatures or simply give yourself the edge against other decks by accessing Skycrusher's Command to give your other creatures +3000 power when they attack. Free cards are free cards, but they become even more valuable if you get them into the battle zone for free at the same time, and Supreme Dragon Bolshack does just that. Overall Supreme Dragon Bolshack is a powerful card that can win you the game with the right deck build. Even if this card isn't your style, it should easily find room in your binder with all the other "cool cards" in this set. I for one love the art that this set has presented thus far and I can't wait to see what else Wizards of the Coast has in store for us! Very nice preview! Thank you for the awesome article. Only problem I had was your statement about this being our first Fire card that allows you to search for a card. Burnclaw the Relentless let you do that way back in 6DSI and was more proactive about it too. Some great picks for Armored Dragons of choice that we know of for Bolshack to search for. 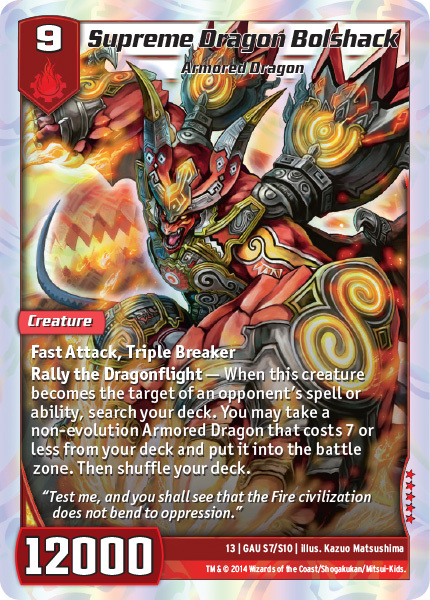 There will have to be some very stiff competition for those not to be top picks for some time to come with the Rally the Dragonflight ability. Keep up the great support for the Kaijudo community!